Contemporary Furniture reflects designs that are current or en vogue. 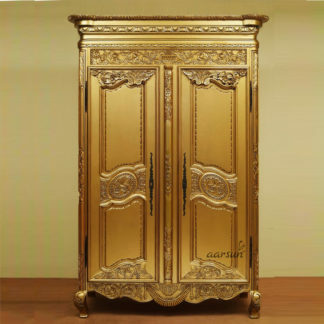 It doesn’t necessarily reference historical design styles and often provides a feeling of everything in its place.Hand crafted Wooden Almirah Wardrobe made of Rose or Sheesham wood. Gives traditional glance to your home and crafted by skilled or experienced worker. 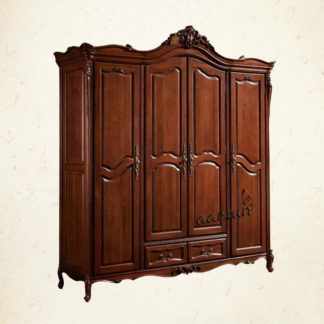 Made out of Sheesham wood, the Multi-Utility Wardrobe comes with a lovely mahogany finish. Resembling an ornately carved door, this wardrobe can add a lot of elegance and beauty to your traditionally themed home. this wardrobe offers enough hanger space for your clothes and a shelf below for your essentials. Aarsunwoods would be glad to customize this wardrobe as per your home decor. The finishes available are teak, honey, walnut, and natural.You can mention the dimensions and even attach a photo or a sketch to let us know the design you want. Looking for a different material design in Wooden Almirah / Wardrobe , have a look at Traditionally Hand-carved Wooden Wardrobe,also in case you require fine carving in sheesham wood, go for Handmade Wooden Almirah.